The Downtown Dayton Partnership (DDP) is a nonprofit organization funded primarily by a Special Improvement District. The Special Improvement District contracts with the DDP to provide a variety of services including business development, advocacy and marketing. The DDP is also supported by downtown businesses who choose to join as members. Our Mission: At the Downtown Dayton Partnership, we are dedicated to making downtown Dayton a better place to live, work, and visit. Working with downtown property owners, businesses and residents, we provide strategic planning, business development and marketing services to grow and strengthen our downtown. 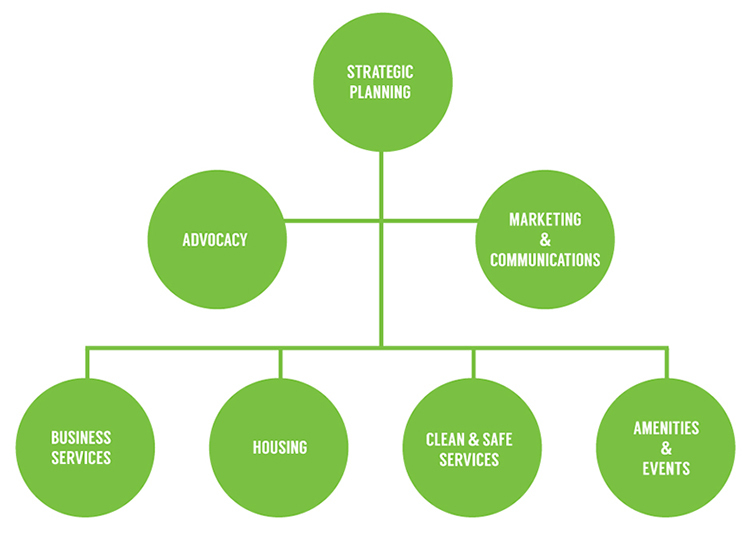 We focus our efforts in seven key areas: strategic planning, business services, advocacy for downtown, marketing & communications, downtown housing, amenities and events, and clean and safe services. Complete details regarding the work we’re doing in these key areas can be found in our five-year services plan for 2016-2020. Details on the Special Improvement District, DDP staff and board, and more can be found at the links to the left. Below you’ll find information on each of our service ares and some of the most commonly requested services available to members and businesses located within the Special Improvement District. Implementing a collaborative, comprehensive strategic plan that is beneficial to property owners, businesses, residents, and visitors helps to attract downtown investment. blueprint for the future of our downtown. The DDP serves as a collective voice and primary advocate for downtown and its property owners, and brings stakeholders together to address challenges and opportunities for our center city. The DDP often acts as an intermediary in matters related to downtown. We can help you meet with the right people and organizations to find a solution. If you need assistance, please call (937) 224-1518. The DDP, with the City of Dayton, develops and implements a coordinated public spaces management program to maintain and enhance downtown Dayton as a clean, safe and welcoming environment. The primary component of the Clean & Safe efforts is the Downtown Dayton Ambassador Program. The ambassadors are on the streets year-round providing cleaning and safety services. you can read more about them here. Other clean and safe efforts include the First Bloom program and the downtown banner program. as it positions downtown in a positive light and improves public perceptions about our center city. The DDP helps promote downtown businesses, amenities, events and more through a wide variety of tools, including email blasts, print pieces and collateral, some advertising, aggressive social media and public relations efforts, and more. The DDP also provides assistance with grand openings and other related needs to member organizations. The DDP works with partners to sustain and grow the residential development critical to establishing the critical mass of residents necessary to support key amenities and retailers. In addition to supporting downtown housing development efforts, the DDP helps promote the urban lifestyle and showcase downtown living options through its marketing materials, resources, and an annual Downtown Housing Tour for the public. More information on downtown living and housing options can be found here. The DDP markets and promotes Dayton’s center city through key events and programs, and creates a framework that further elevates downtown’s amenity and event options while spurring development. In addition to planning and executing such signature downtown events as the Dayton Holiday Festival, First Fridays, and DP&L Summer in the City events, the DDP helps promote hundreds of other downtown events and amenities that attract visitors to our center city. For more info on downtown amenities and events, visit the Things to Do section or our calendar of events. The Downtown Dayton Partnership provides targeted services that positively impact the downtown business environment while working with partners, property owners and businesses to promote job growth. The DDP’s Site Seeker program, property listings, and other resources help new businesses find their space downtown. Once they’re here, Retention & Expansion efforts and an attentive support system help them stay and thrive. Learn more about the DDP’s many business services, resources, entrepreneurial support, and much more in the Doing Business section of this website, or contact us for more information. We may be the only organization focused specifically on downtown Dayton, but downtown’s success is a group effort. Many businesses and organizations contribute in many ways to downtown’s positive momentum, and those collective efforts are what makes downtown Dayton a great place to be. If you’re looking for help or you’d like more information about our services, give us a call at (937) 224-1518 or contact us through this site.